Rich soil with compost dug in. pH of 6 to 6.5 is preferred. Gooseberries grow best in locations that receive morning sun and afternoon shade, or dappled shade part of the day. Many cultivars are hardy to -40F (-40C). These cold-natured plants seldom produce well in warmer climates where temperature often top 90F (32C). Fertilize in late fall by spreading a 1-inch (2.5 cm) layer of composted manure over the root zones of the plants. Slow-growing plants can be fed again in early summer. Plant in spring, just as the plants are emerging from dormancy. Set plants slightly deeper than they grew in their nursery pots. Mulch after planting to keep the soil cool and moist. 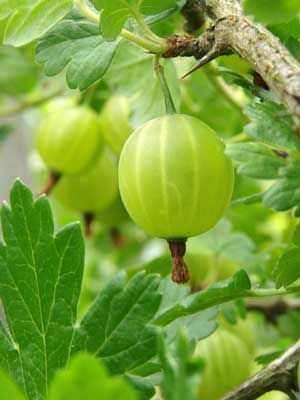 Newer gooseberry varieties including ‘Hinnomaki Red’ and ‘Tixia’ have an upright growing habit, few thorns, and often produce fruits that turn red when ripe. In winter, prune out old branches close to the ground. With older, spreading varieties, prune out lateral branches lying close to the ground as well as those that appear to be rooting at the tips. Mature gooseberries bear best on two-year-old branches. Harvest fruit when they are ripe and fully colored, and chill immediately. Gooseberries freeze very well. Garden Boundaries that Look Great and Taste Amazing!